Concepts The Patch Editor has been designed for easy parameter editing for many of the older keyboards with easy to use controls for every synth type. Every active control will light up to make fast changes simple and buttons are colour coded depending which state is active. Each control that is changed will clearly identify itself on the display. There was a stage when most of the keyboards manufactures went though a process of removing all the knobs and replacing them with a parameter driven system. Anyone who has used one will know how difficult it is to use, especially live. When the complaints started arriving some started making plug in patch editors. The problem with these is they only worked on one type of keyboard and were (and still are) expensive and rare. 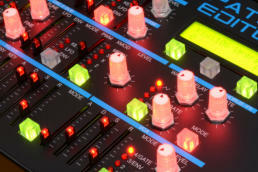 The 'Patch Editor' can be used in place of a PG-300 or MPG-80 as well as handle midi control of midi and sysex capable keyboards. It includes an internet update system for software changes or new keyboards support, and includes an external input that can be mapped to any continuous control and all the active controls light up to make it easy to use. Each control in each synth is kept in lookup tables. This approach has made the Patch Editor very versatile and flexible. Some of the features are: • Can translate midiCC to the currently selected patch. This will allow any synth to be controlled via midiCC for software that does not support sysex. One midiCC command for filter cutoff adjust, for instance, will output the correct codes for filter cutoff adjust for any selected synth. • Can control both the Upper & Lower Tone boards in the MKS-70 & MKS-80 from the Patch Editor directly separately or combined. Note, the MKS-70 needs the latest system ROM (v1.08). • Every control identifies itself and it's value on the display in real time. This is important when unused controls are reassigned as is done in some synth types. • Colours change as controls are moved and each page uses it’s own colour for easy page identification. • Each synth type has a separate synth midi channel which is remembered. The Patch Editor also has a midi channel for it's own midiCC control. • All switch positions are remembered for each synth type. • The ext input allows control of any one variable parameter from an external voltage source. For example a foot pedal could be used to control the filter cut off much like a waa waa pedal might. • The control lights can be dimmed to suit current light levels. • Top quality components have been used throughout. This has added to the price but you get something that will work well when it is supposed to and will last. Power supply required is 12vDC with a minimum of 1Amp and the Patch Editor has reverse polarity protection built in. The plug required for power connection is a DC style 2.5mm ID, 5.5mm OD and 10-14mm shaft length with positive on the inside. Here is an independent review (in German). Here is an independent review from SOS. Notes (1) Use Midi Channel 1 with the Korg DW-6000 (2) The MKS-70 needs the latest version of system code (v1.08) to run correctly. This is available from KiwiTechnics, Synthparts or Roland. It is only necessary to change the A Rom if on v1.04 or later. For v1.03 or older you will require the A, B & C Roms. (3) The 8P is run via midi and the PG-800 is not required (4) The JX-10 should be run as an MKS-70 with the Colin Fraser JX-10SE code fitted. (5) The SC Max uses the Sixtrak patch but not all Sixtrak controls are supported by the Max. See the user manual for details. (6) The Cheetah MS6 requires program v1.3 and details can be found at the Cheetah MS6 Resource Center (7) The Mx6,6r&1000 control is not suitable for live use as the Mx6,6r&1000 are not able to process sysex data quickly enough. This will cause hanging notes and other random midi errors. Not all controls work correctly due to midi errors in the Oberheims. M6&6R require PE v4.7 or higher.